A hands on detailed comparison between the mobile phone navigation apps Apple Maps, Google Maps and Waze on an US road trip. 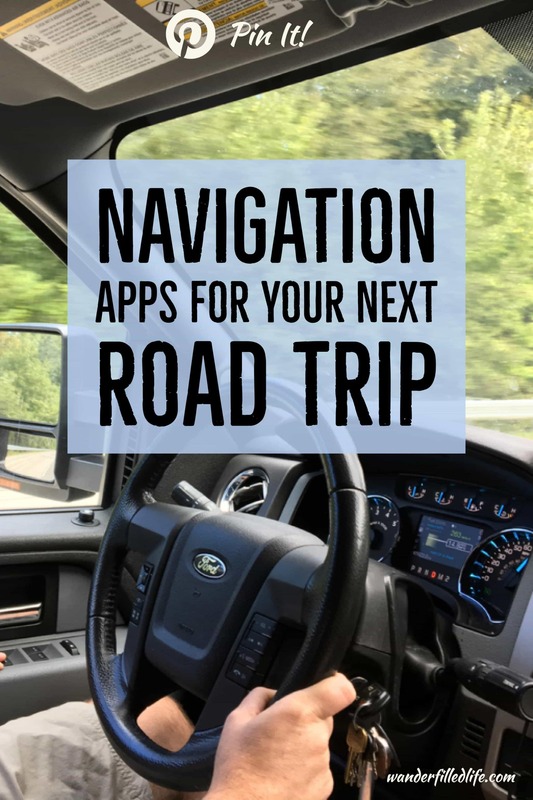 So, let’s talk about the navigation apps we use on a road trip. The advent of smart phones has made traveling significantly easier than in the past, but finding the right app to suit your needs is a bit of a pain. The first major app you will need to get running is a navigation app. For many folks, this boils down to one of three choices, depending on the phone you use: Apple Maps, Google Maps and Waze. For our trip to Savannah, I made a point to use all three at various points during the drive and there are good and bad points to all of them. For those without an iPhone, you can skip this section. Apple Maps is exclusive to Apple products. When it first launched, critics maligned Apple Maps for inaccuracies and being less complete than Google Maps and rightfully so. It was an OK product at the time, but Google Maps was much better. Now, Apple Maps is, in most categories, the equal of Google Maps. In using Apple Maps, I found it to be easier to get navigation started than Google Maps. I found the interface to be the most easily read of all three of the choices, especially the arrival information at the bottom. Apple Maps’ interface has gotten a lot better and is easier to read than any of the other apps. 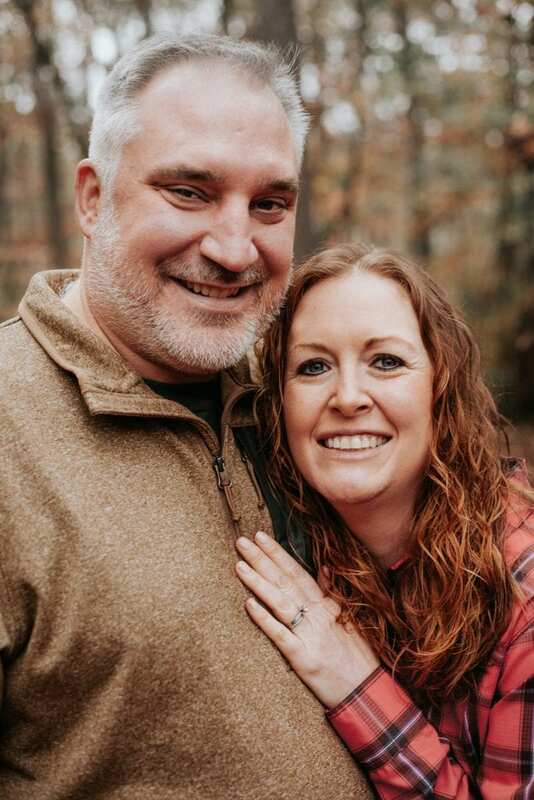 The most recent update changed the main directions at the top to white lettering on a black background, making for a much-improved experience over the previous black lettering on a white background. Another new feature is remembering where you parked your car. That’s a handy feature in big parking lots. From a pedestrian point of view, Apple Maps has always done a good job in my opinion. We have only had difficulty a couple of times using Apple Maps for walking directions, mainly back in 2013 when we were walking through Rome. Apple has also been slowly adding more cities to it’s mass transit directions. When we were on the outskirts of Boston this past summer, we got an alert that Boston mass transit information had been downloaded to Apple Maps. I wouldn’t say it is as good as Google Maps in this regard, but it is certainly getting better. Apple Maps has two major points going for it: Siri integration and the Apple Watch. I can say “I need directions home,” and Apple Maps just pops up and is ready to go. That’s convenient. Another major convenience, if you have an Apple Watch, is walking directions with turn notifications coming in on your watch. Not having to glance at your phone every time you need to make a turn is a huge thing when traversing a city you don’t know. Google Maps is the gold standard of navigation apps and has been for quite some time. Google Maps has been around, has fixed its problems, and is a very stable platform for any mode of navigation. While I rarely use Google Maps, I will always keep it on my phone because it is solid and reliable. 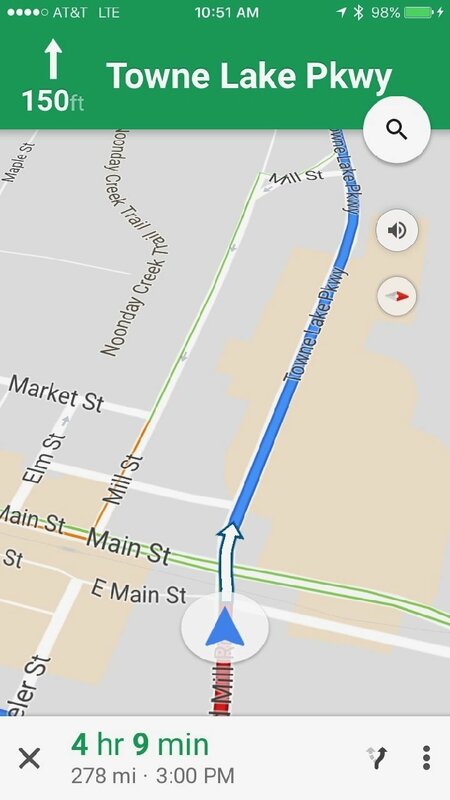 The newest Google Maps app has lane assist, a feature found in dedicated GPS units. Lane assist is very nice and does work well, especially the voice prompts. While the interface is not as easy to read as the Apple Maps interface (the white on green just isn’t quite as readable), it does show the lanes you should use up at the top. Honestly, Google Maps might be my go to navigation app anytime I drive through a major city. Having lane assist will make merging with the trailer much, much easier. Another nice feature of Google Maps is highlighting the turns on the map. That does make it easier to figure out what you need to do, assuming the map is spot on to reality. Even Google Maps falls short in that department occasionally. Google Maps also does a good job of adjusting the zoom of the map to frame what I need to see. This is one area Google Maps’ interface does beat out Apple’s. One major flaw of both Apple Maps and Google Maps is the inability to just drive with it, without turning on navigation to a destination. Neither mapping system will give you the same view of driving without actively navigating. Why would I want that? Sometimes, I know where I am going and how to get there, but I want to get the additional information (cross streets, traffic information) provided by my navigation app. There is only one contender that allows that and that’s Waze. Waze is my absolute favorite navigation app. 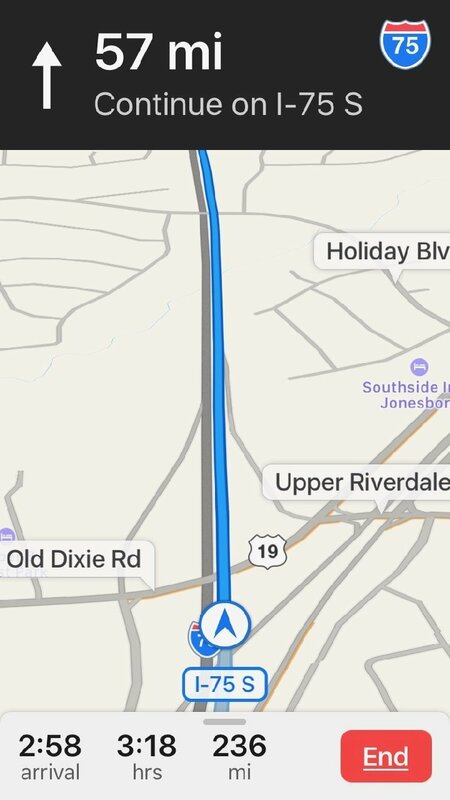 Seriously, I love Waze for a road trip. Most of the time, Waze will give me great directions, actively avoiding traffic. Sometimes, Waze will take me some very weird routes, which will only save a minute or two, but still Waze values my time. Let’s talk about traffic. 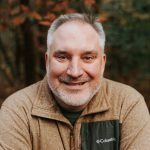 Waze not only gets its information from traffic systems, it also gets it from other Waze users on the road with you, which makes for a far more comprehensive approach to dealing with traffic. Waze is constantly reevaluating your arrival time and looking for other options. For example, there was significant traffic in a couple of spots in downtown Atlanta on our way home from our latest trip to Savannah. Waze routed us away from I-75 on to I-675, on to I-285, back on to I-75, on to Langford Parkway and then on to I-285 again… All to avoid a 30 minute delay. It worked, as we barely slowed down going around Atlanta. 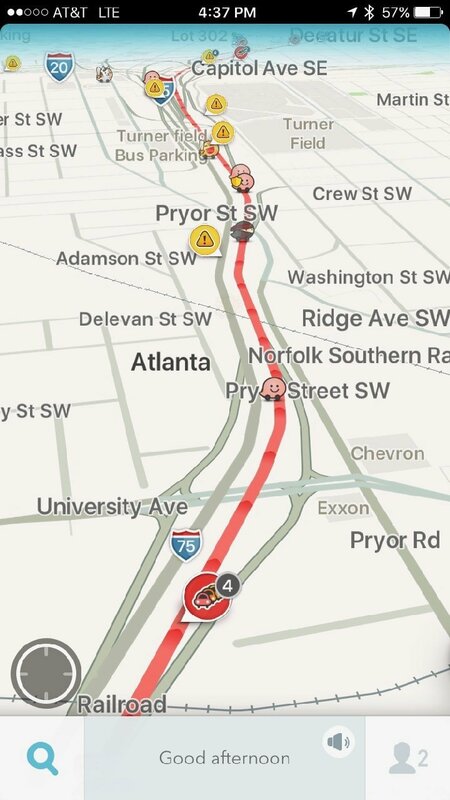 Waze navigated us around all of this traffic through Atlanta. What makes Waze awesome is it’s ability to leverage other drivers to provide real-time updates on road conditions. There’s a piece of tire on the highway? Another Wazer spots it and throws up an alert. As you approach, you get an alert there is an object in the road… Or a speed trap… or a vehicle stopped on the shoulder…. and that is Waze’s flaw. Waze is both busy and noisy. You will get a lot of alerts, particularly in urban areas. Some of them will be valuable. Others will not. If you are cruising in the left lane, most vehicles stopped on the shoulder will be scenery, not a hazard. For the guy towing a camper, they could be a hazard if they are not over far enough. You have to decide which alerts are valuable to you at which time. Waze’s interface is also pretty cluttered, both with alerts and other information. The white on black for directions is clear, but the blue on black is harder to read and the bottom ETA area is much harder to read than either Google Maps or Apple Maps. 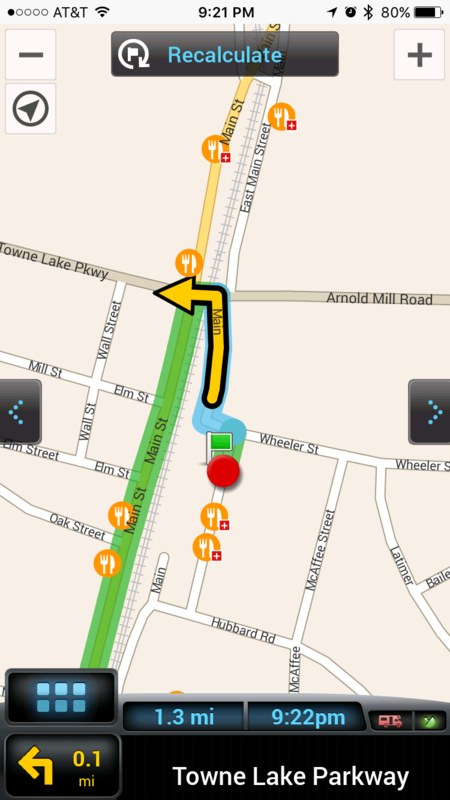 Waze’s interface is more cluttered, but does provide a lot more information. One thing I really like and miss when I am using another navigation app is the speedometer. 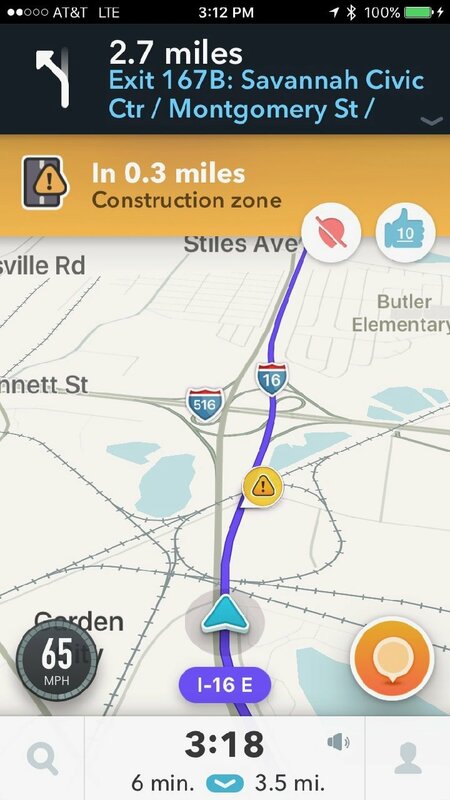 Waze will tell you how fast you are going based upon GPS. It will also tell you, provided there is data on it, the local speed limit. I have found this feature pretty handy and about 95% accurate. Since Waze relies on users reporting hazards, etc., it has a set up for reporting something you see. While the interface is as good as it could be, it does take your eyes off the road to make a report… unless you use the voice command feature. 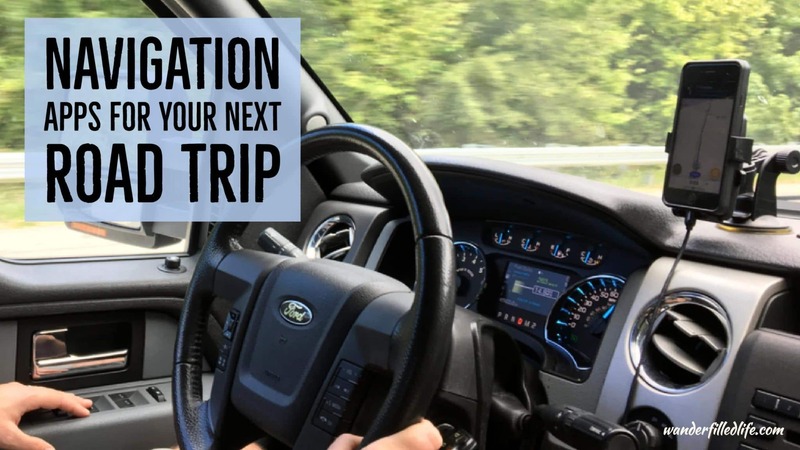 A three-finger tap on the scree will, most of the time, bring up a voice prompt and allow you to report a hazard without taking your eyes off the road. This works most (75%) of the time, but there are times Waze does a poor job at voice recognition. Waze does allow you to turn on the interface without starting navigation, which is very handy if you know where you are going but want traffic and hazard updates along the way. Waze is only for driving, so it does not support walking or mass transit directions. Google owns it and its mapping is spot on. One thing none of the above app do is provide directions specifically for large trucks or RVs. The big thing we worry about when using a navigation program is being routed into a low-clearance or an area where RVs are not allowed. On the road trip we took over the summer, it only happened twice. 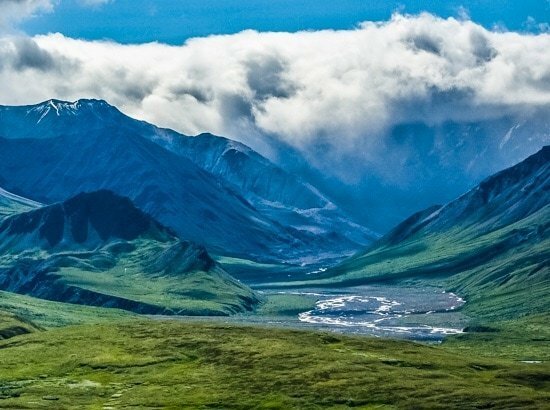 Once as a road that did not allow RVs, which we knew about in advance. Once was a road in Maryland which had too low a clearance ahead sign. I spotted the sign before we went more than a few feet on to the road. The CoPilot navigation app does provide RV-friendly features, but costs $9.99 per year. CoPilot does make an app which included areas where RVs are not allowed or low clearance areas. While the basic app is free, voice navigation costs $9.99 per year. The good news is you can download the maps for use offline. The interface, however, is akin to Google Maps before it offered fluid navigation. All three map programs are worth having on your phone, if you have an iPhone, and all three are free. I also suggest getting the appropriate CoPilot app if you have an RV. If you are a full-timer, paying for the app might be worth it to you.